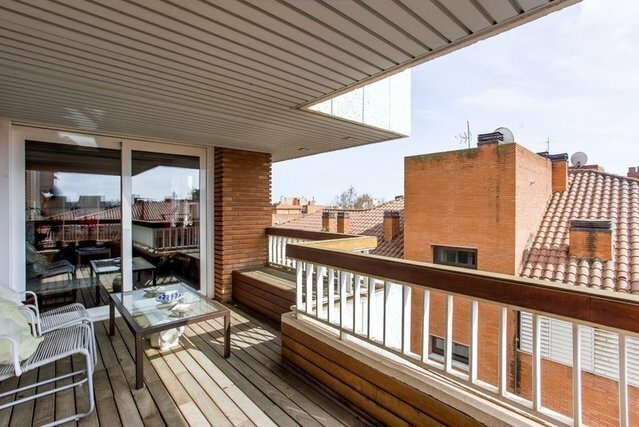 In the exclusive area of ​​Sarria - Bonanova and next to the international schools we have this fabulous 260 m2 flat in a beautiful 5 storey building with elevator and concierge and with only 12 neighbors. It presents an ideal distribution by differentiating the day zone and the night zone. At the entrance we find the large reception that communicates with a large living room of 54 m2 with fireplace and exit to a sunny terrace of 11 m2. Next to the living room a toilet. In front is the independent office kitchen, with island fully equipped, and a service room and a bathroom. Then the night area with 4 double bedrooms one of them suite and three bathrooms. This fantastic apartment is very bright and sunny outside. It has a parking space for two cars. In the communal area there is a social room to hold events, gym, showers, sauna, storage room and garden Contact us for more information.